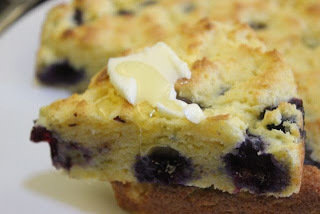 This is a simple, but oh-so-delicious update to my gluten-free cornbread recipe. 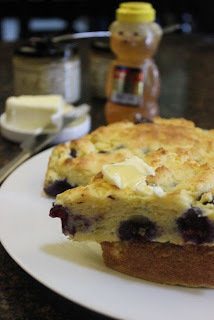 The blueberries add a little extra nutrition and wonderful taste. Add a little honey and it's almost like eating dessert! Heat your oven to 425 degrees. Grease an 8 inch pan and line with parchment paper (click here for the how-to for lining a round pan). Cream butter and sugar together in a large bowl using an electric mixer. Add the eggs and mix. Stir in the milk and sour cream. Add the dry ingredients and blueberries and mix until just blended. Pour batter into prepared pan and bake 18-22 minutes. Serve warm with butter and honey. Enjoy! !